In today's Revive Your Heart, chapter 4 talks about assumptions. This is assuming that other's have a bad intention towards you. Nouman Ali Khan explains that we must put great effort in getting away from thinking bad about others. Suspicion is something that is a natural companion to us, it will follow us so we must always try to push it away. Suspicion is something that we were unsure about but it becomes a certainty in our minds over time. This is the basic concept from the book. When your child doesn't do what you've asked, your first thoughts might be 'Why doesn't he listen to me? He doesn't want to do what I tell him. He just wants to do what he likes. He's so..." and on it goes until it becomes certain in your mind that he's truly disobedient. Don't be suspicious and assume that he's disobedient. Parents tend to jump to conclusions and assume the worst. Instead you should be assuming the best from your child. Maybe he intended to do it but forgot. Maybe he mistakenly did the wrong thing or maybe he just didn't know how to do it. If he forgot then remind him. If he made a mistake then tell him again what needs to be done. If he doesn't know then show him how to do it. The key is to always assume that your child means well. This doesn't mean that you ignore bad behaviour and hope that it'll go away. If it's a behaviour that needs improving then help your child by asking if your child needs to be reminded, be directed or be shown the desired behaviour. Sometimes your child might want to come to give you a hug and you might think 'Why is he hugging me? I bet he wants some ice-cream or money'. Over time, you become convinced that there's an ulterior motive from any nice behaviour from him. This is more likely when you've not have a close relationship with your child. 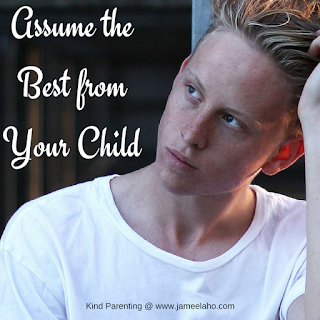 Don't be suspicious but always assume the best from your child. If it turns out that he does want something from you then talk to him about it. Say, "It's nice when you give me a hug. It feels good. You can give me a hug any time without wanting something in return. If you need something from me then ask and we can work it out." Want to read the original? You might like to get the book (my affiliate link).